Portrait of Jan Luyken from the Bowyer Bible in Bolton Museum, England. Volume 1 print 7. Burning of Maria and Ursula van Beckum. Engraving by Jan Luiken in Martyrs Mirror, v. 2, p. 65 of Dutch edition. Jan Luiken (Luiken, Luycken): famous engraver and poet, especially of devotional poems, born 16 April 1649, at Amsterdam, died there 5 April 1712. He became an apprentice in the atelier of Martinus Saeghmolen, and moved in a frivolous anti-church society. This is the period of his bombastic book of poems, Duytse Lier (1671), and his acquaintance with Maria de Oudens (1646-82), whom he married in 1672. Four of his five children died young. The oldest son, Caspar Luiken (1672-1708), was also trained as an engraver by his father, and supported his father during his last years. His work was chiefly in illustrating books. Of Caspar's work 1,187 pieces were extant in the 1950s. In 1673 Jan Luiken was baptized in the Lamist Mennonite Church at Amsterdam, and shortly after joined the Mennonite congregation at Beverwijk, about 16 miles northwest of Amsterdam, though he was probably attracted by the Collegiant views of Paulus Bastiaensz of Beverwijk, where he stayed for a time. But the great change in his life came at a later period. The book Kort Verhaal van het Godvrugtig leven en Zalig Afsterven van Joannes Luiken (1712) reports, "In the twenty-sixth year of his life the Lord appeared in his heart in a powerful manner" (1675), whereupon, "afire with the love of God, he forsook his old bad company," to join the God-fearing. These were the followers of Jakob Böhme. There was at that time a colony of Böhme's disciples, under the leadership of Coenraad van Beuningen, a noted statesman, Professor Allardt de Raedt, and especially Johann Georg Gichtel, a lawyer who had been expelled from Regensburg. Galenus Abrahamsz, Mennonite preacher and physician, must have had some influence upon Luiken's conversion. After his conversion Luiken withdrew from the church. In solitude he continued his etching and his contemplation; closely attached to a few kindred spirits, he wrote mystical poems tinged with pantheism. In the course of time these poems were considered orthodox and were held in high esteem in pietistic circles in the first half of the 19th century. With the publication of Hylkema's book Reformateurs (1900-1902) a new light was shed on these devotional poems, revealing their anti-church and heterodox character. Since then these poems have been even more admired. A number of volumes of these lyrics, with artistic steel etchings, appeared in the course of time: Jesus en de Ziel (1678), Voncken der Liefde Jesu (1687), De Spiegel van het Menselijk bedrijf (1694), Zedelijke en Stichtelijke Gezangen (1704), Besehouwing der Wereld (1708), De Bykorf des Gemoeds (1709), Het Leersaam Huisraad (1709), De onwaardige Wereld (1710). After Luiken's death there appeared: Schriftuurlijke Geschiedenissen en Gelijkenissen (1712), Des menschen Begin, Midden en Linde (1712), Geestelijke Brieven (1714), Verzameling van Geestelijke Brieven (1741), Het Overvloeiend Herte (1767). A number of his poems are found in former Dutch hymnbooks, and even in the Doopsgezinde Bundel. Ten years after Luiken's death the widow of Barend Visscher published a collection of ninety-two Luiken engravings, professedly among his best, illustrating events from early church history. Beneath each plate is a verse of six lines by Claas Bruin (1671-1732), who was a member of Luiken's circle of devotional poets. Opposite each plate is a poem by Pieter Langendijk (1683-1756). Jan Luiken was a very important, versatile, and creative Dutch engraver and etcher in the period after Rembrandt; 3,275 works are known to be his. His favorite field was the illustration of books. In addition to travel literature and historical works he used many Biblical subjects. He made his own preliminary sketches; many of them can be seen in Amsterdam (Prentenkabinet and Museum Fodor); Haarlem (Teyler Museum), and Rotterdam, as well as in London (British Museum) and Vienna. His work is distinguished for its clarity, especially in group studies. His best illustrations are found in his own books of poems. 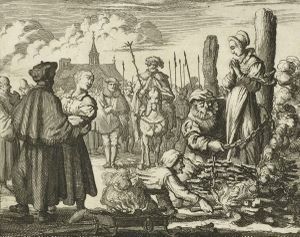 For the second edition (1685) of van Braght's Martyrs' Mirror he furnished 104 copper etchings, illustrating the martyrdom of Anabaptists and Mennonites of the 16th century. These plates with eleven additional plates from J. L. Gottfried, Historische Kronyck (Leyden, 1698), were reprinted at Leiden without van Braght's text, with French and German captions, and called Theatre des Martyrs. A Dutch edition was published in 1738 by Marten Schagen at Alkmaar. They also appeared in the 1780 edition of the Martyrs' Mirror printed at Pirmasens, and in 20th century North American editions. After the printing of the Pirmasens edition the plates were supposedly lost; in 1925 they reappeared in South Germany in private possession. Bibliographie del Martyrologes II: 417-28. Doopsgezinde Bijdragen (1890): 71; (1900): 90 f.; (1902): 99 f.
Hege, Chr. "Ein kurpfälzische Bücherverbot." in Mennonitische Geschichtsblatter (1936): 26. Henkel, M. D. "Jan and Caspar Luyken." In Allgemeines Lexikon der bildenden Künstler, ed. Hans Vollmer. Leipzig, 1929: 488-89. Hylkema, C. B. De Gids XIV (1904): 28. Kalif, G. Geschiedenis der Nederl. Letterkunde IV. Groningen, 1910: 467, 522-37, 543-47. Luiken, Jan. The Drama of the Martyrs: From the Death of Jesus Christ up to the Recent Times. Lancaster, Pa. : Mennonite Historical Associates, 1975. Luycken, J. Tafereelen der eerste Christenen. Amsterdam, 1722.
van der Does, J. C. Nieuwe Taalgids (1929), No. 197; (1930), No. 245). van der Does, J. C. Stemmen des Tijds (1928), Nos. 137 and 264; (1929), Nos. 147 and 508; (1931), No. 621). van Eeghen, P. Het Werk van Jan en Casper Luycken. Amsterdam, 1905. A complete bibliography on Luycken (1712-1889) is found in Dr. Maurits Sabbe, Joan Luykens Duytse Lier (Zutphen). Hylkema, C. B. and Christian Hege. "Luiken, Jan (1649-1712)." Global Anabaptist Mennonite Encyclopedia Online. 1953. Web. 19 Apr 2019. http://gameo.org/index.php?title=Luiken,_Jan_(1649-1712)&oldid=141506. Hylkema, C. B. and Christian Hege. (1953). Luiken, Jan (1649-1712). Global Anabaptist Mennonite Encyclopedia Online. Retrieved 19 April 2019, from http://gameo.org/index.php?title=Luiken,_Jan_(1649-1712)&oldid=141506. Adapted by permission of Herald Press, Harrisonburg, Virginia, from Mennonite Encyclopedia, Vol. 3, pp. 423-424. All rights reserved. This page was last modified on 2 December 2016, at 08:52.